Also known as Ramiel, Remiel. Jeremiel's name means ("mercy of God." In ancient Judaic texts, Jeremiel is listed as one of the seven core archangels. He's also associated with helping Baruch, a prolific author of apocryphal Judaic texts in the first century A.D., with his prophetic visions. One vision, catalyzed by Jeremiel, was of the coming Messiah. In another vision, Jeremiel took Baruch for a tour of the different levels of Heaven. In addition to being an Archangel of prophetic visions, Jeremiel helps newly crossed-over souls review their lives. This is a service he helps the still-living with, too. If you'd like to take an inventory of your I life up till now so that you can make positive adjustments, call upon Jeremiel. He will help you fearlessly assess your history and learn from prior experiences so that you're even stronger and more centered in love in the future. Jeremiel says, "A life review today, held at regular intervals, will prove to be of great benefit to you in determining your next station and steps. By reviewing your life along the way, you make your duty that much more enjoyable when you get to the other side. You'll already have reviewed the major crossroads, and won't suffer or have regrets when you admit to yourself that you could have done better. "A life review is far more comprehensive on the other side, of course, but you can compose one while you're still in physicality. Carve out some quiet time and ask me to enter your thoughts or dreams at night. I shall display pictures of major events within your life that will spark your memory of smaller occurrences. It's often in those seemingly minor interactions with other people that your greatest realizations occur. This is where life lessons often spring from. Then, you can easily base your philosophies and decisions upon what you've realized, which will always be for the benefit of everyone involved." 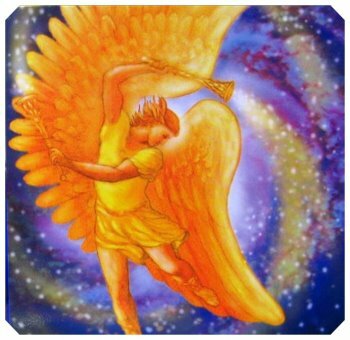 "Archangel Jeremiel, please help me release fears, worries, and tension about my future . . . and the future of the world. [Tell Jeremiel about any situation that is weighing particularly on your mind.] I ask for your prophetic insights about the future. Please clearly give me guidance about anything that I may do or change to create the highest and best future for myself and all concerned. Thank you."